How much cognitive ability do we lose over time as we age? Yesterday you learned after the age of 25 you lose 2 grams of your brain mass per year. That means at the age of 80 you have loss about 7.5 % of your brain mass. The question is how does this affect our cognitive ability? Nature Neuroscience Reviews that looked at the same people as they aged in a longitudinal study found the decline in cognitive function occurred considerably later. You can see that perceptual speed peaks very early, the best performance occurred at age 25 –which is also consistent with the above results. This makes sense young people are ‘faster’. But when you look at some of the other cognitive functions we see some very interesting results. 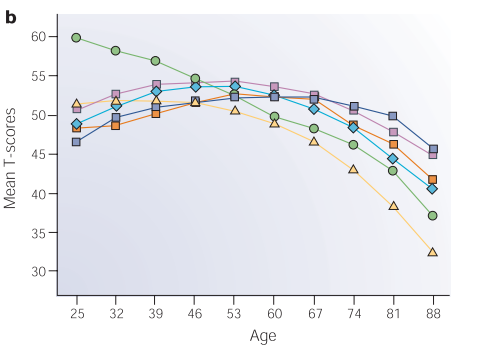 The next earliest peak occurs in numeric ability which starts declining by the time people reach 46, but still high at age 39. But maybe most interestingly is that for other cognitive functions like verbal memory, inductive reasoning, spatial reasoning, and verbal ability the peak does not occur until around age 53. Wow! And verbal ability does not seem to peak until the age of 67. This you might argue makes sense since many of the best ever novels have been written by people past the age of 50. Now one big difference between these two papers is what cognitive functions they tested, so this could possibly explain the somewhat conflicting results. But the fluid intelligence, which the authors also call reasoning, from the top paper peaked at 25 where the longitudinal study testing inductive reasoning didn’t peak until 53. So not sure why these two studies find such different peaks for reasoning based testing. As usual more research is required to fully elucidate the relationship between aging and cognition. While some cognitive functions peak at around the age of 25, which correlates with peak brain mass, but it appears many other cognitive functions including inductive reasoning and verbal ability do not peak until sometime after 50 years old. The next question is which correlates best with cognitive ability as we age: neuron or white matter loss. ← How much of your brain mass do you lose each year?